This renovation strives to respect the classic features of prewar New York architecture, while updating them to meet contemporary needs. The entry foyer was reorganized to become a central node connecting the dining room, living room, and bedroom areas with a series of large walnut open door frames. 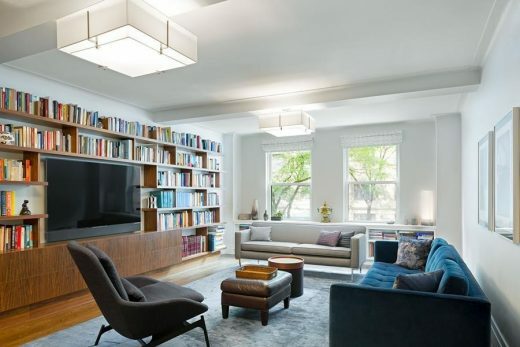 The main public spaces were redesigned to create a large and open kitchen adjacent to the dining room from which one can glance to the living room through a small bookcase slot. Open, staggered bookshelves accommodate the owners’ vast library, a formal theme which is repeated in the master bedroom. “The old shall be renewed and the new shall be sanctified” is a famous quote from Rabbi Kook. We are guided by this quote in our design for the renovations for a one hundred year old synagogue in Manhattan. We strive to respect and renew the building’s historical features while sanctifying it by making it more sustainable and accessible and availing it of the benefits of current technology. As architects we should find design solutions that function for everyone, including the spectrum of gender identities that do not fit into the male/female binary. What if bathrooms were organized by size Instead of gender? When we combine the men’s and women’s restroom we fit three more toilets and urinals. Architecture solves problems and together we can redesign public restrooms. This video was created in response to the recent public and legal debate about which bathroom transgender people should use. While considering this question it became clear to me that the typical gender divided public bathroom creates inconvenient situations which affect a wide range of the population. I therefore suggest that bathrooms should be designed to accommodate the complexity of real life and be labeled by size rather than by gender, “this is better for everyone”, as I say in the narration. Innovative solutions, both in architectural design and in other field, often emerges when the problem itself is redefined. I hope this video exposes the functional problems of public gendered restrooms, and inspires others to join me in finding new solutions to this question. The house an extruded box from which slices were cut to reduce the square footage and create an intelligent and beautiful house. Cuts into the basic form reveal its shape and functions. A slice in the front of the house places the carport on an incline and conceals the parked car from the street. A large opposing slice on the south removes a volume to create a covered sun deck. Studio ST Architects is a full-service architectural firm located in Manhattan that is dedicated to exploring the embedded logics of materials and structures to generate new spatial experiences. They believe in innovative and responsible design and are intrigued by computer technologies that change design and production methods, striving to apply these tools in creative ways. 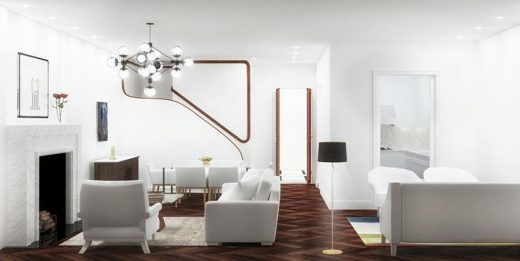 Built work by Studio ST is a combination of high-end residential renovations and budget-conscious construction projects for real-estate developers. 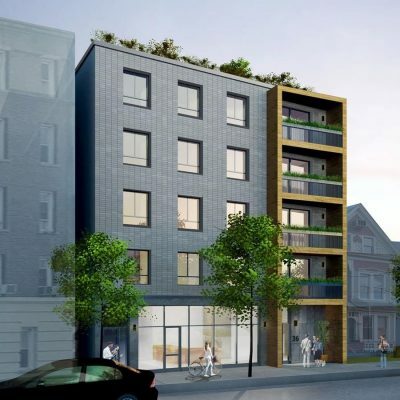 Among these are a small apartment building in Brooklyn, a number of high-end duplex renovations in Manhattan, and a single family house in New Jersey. 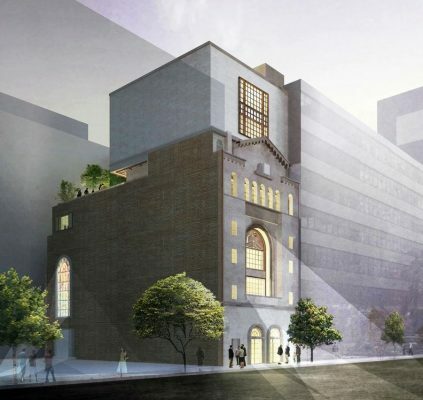 Studio ST recently started working on two public buildings; the renovation of the 14th Street Y and the Kesher Synagogue in New Jersey. Studio ST Architects also regularly participates in international competitions and was invited to submit designs for the Mediatheque in France and the Hoboken 9/11 Memorial. Their work has been published in various architectural magazines and monographs in North America, the Middle East, Europe and Asia. Studio ST frequently collaborates with other firms. Studio ST and dZO worked together on the design of the Mediatheque and the Hoboken 9/11 Memorial. Studio ST and Z-A collaborated on the Prague National Library, the Stockholm Public Library and Swell House. Studio ST Architects was founded by Esther Sperber in 2003. Esther was born and raised in Jerusalem, Israel. Her first degree is from the Technion and she came to New York in 1997 to complete a master’s degree in architecture at Columbia University. August 7, 2018 in Architects.